Ms. George from Musselman’s e-mailed me about this promotion where they are partnering up with the National Breast Cancer Foundation. You can help out by purchasing some Natural and Healthy Picks Apple Sauce during the month of JANUARY, for 10 cents of every package is donated to the National Breast Cancer Foundation! You can find out some more information about it here. HOMEDICS Neck and Shoulder Massager review & the WINNER! I opened the package and took out the massager. Pretty interesting! 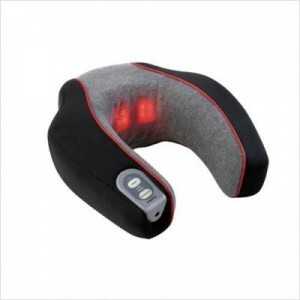 You can only use the heat part of massager if it’s plugged in, but there is the option of using batteries. Unfortunately, it didn’t come with batteries, so first I had to rummage the drawers in my house to find the pack of batteries. Luckily, I found them and put them in the compartment under the zippered exterior. Then, I tried it both plugged in and with the batteries after placing it on my neck. It was a tad bit big for me, but not too bad. There are two options for the massage, a High and a Low, and I preferred the low, lighter option. When I put it on the High option, it almost kind of gave me a headache. The heat was a nice touch, although slightly annoying that you can’t use the heat with just the batteries, and needed the plug. It was a mild heat, which felt nice. Overall, I would call this a neck massager, not a neck and shoulder massager. It did little really for my shoulder, and mostly concentrated on my neck. Although I can see it being helpful when neck pain is a problem. 2 stars. selected via random.org! Congrats! Please email me your information so I can ship out the prize! 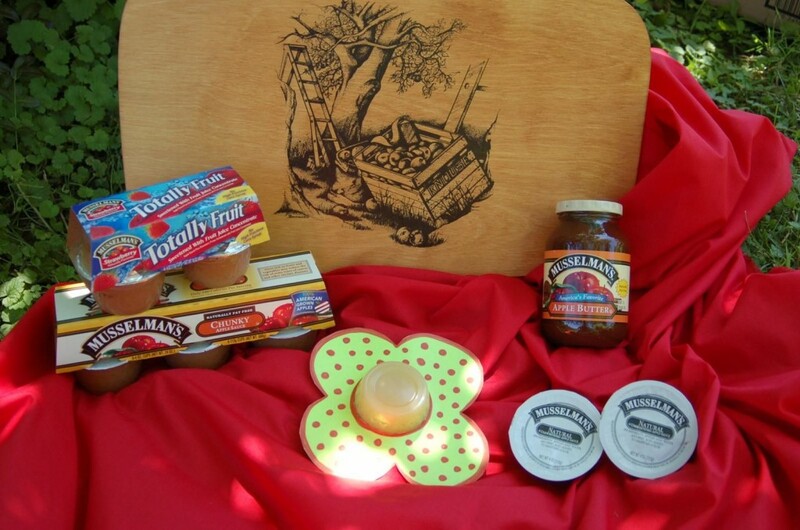 Musselman’s Apple Butter & Apple Cider review and GIVEAWAY!!!! Yes! It’s that time again- A GIVEAWAY!!! But first, a review of some tasty products! First things first, the person I was with said for me to shake this up, and I advise you to do the same. It was a bit piecy at the bottom, but nothing a little shake of the bottle couldn’t fix. First I tried it cold, and it was sort of like a watered down apple juice. Sweet but didn’t have that apple-y kick I’m used to with apple juice. So, the person who told me to shake it, also advised me to have it warm. I was given the Apple Butter and Apple Cider by Musselman’s for free to do a review(how could I refuse!? I love apples! ), and was given an extra Apple Butter and Apple Cider. So, what better way to spread the love then to host a giveaway!?! PLEASE leave a comment for EACH entry. If it’s two entries, please leave TWO comments, etc. Thank you!! 1. What’s your favorite product containing apples? I happen to love pretty much apple anything, but I LOVE apple pie or baked apples. MMM! 4. Leave a comment on any of my other reviews! Open to U.S. Residents Only. Contest ends November 20th 2010. 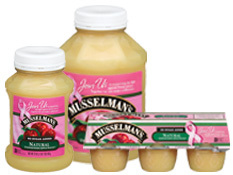 Musselman's Natural Applesauce for Breast Cancer + GIVEAWAY! Yum. I love applesauce. Growing up, i would have it pretty much with everything. Chicken nuggets, macaroni & cheese, as a side with my mashed potatoes. I just love applesauce! 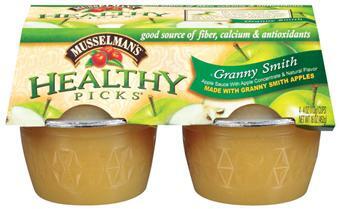 Which is why i was super excited to try Musselman’s Healthy Picks Applesauce in cool flavors like Key Lime Cupuacu, Raspberry Acai, and Blueberry Pomegranate. Their line is “designed specifically for people with busy, active lifestyles”, which is just PERFECT for me. Musselman makes this line with no artificial colors or flavors, no added sugar, enriched with calcium and vitamin C, and is a good source of fiber per cup. I decided to have these with a granola bar pre workout. Apples supposedly wake you up better than a cup of coffee (I work out in the mornings), and according to Musselman’s pamphlet i was provided with, “Apples contain complex carbohydrates that give you energy faster than eating something high in sugar”. Energy & Antioxidants-nice! Berry Pomegranate- This one had a nice blueberry flavor too it. It wasn’t too sweet, and complimented my granola bar nicely. It had a slightly bitter aftertaste to it, probably due to the pomegranate. Raspberry Acai- this one was sweeter than the pomegranate flavor. It had a hint of a lemony taste to it, and was tartish so to speak. It wasn’t bitter, but had a tart flavor to it. In my opinion it had more of a cherry flavor than raspberry, but i liked this one. Key Lime Cupuacu- uh.. YUM! This one was the BEST! 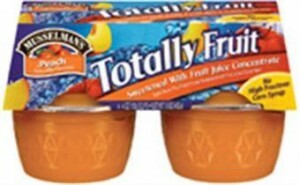 It also was slightly tart, and sweeter than both of the other varieties. 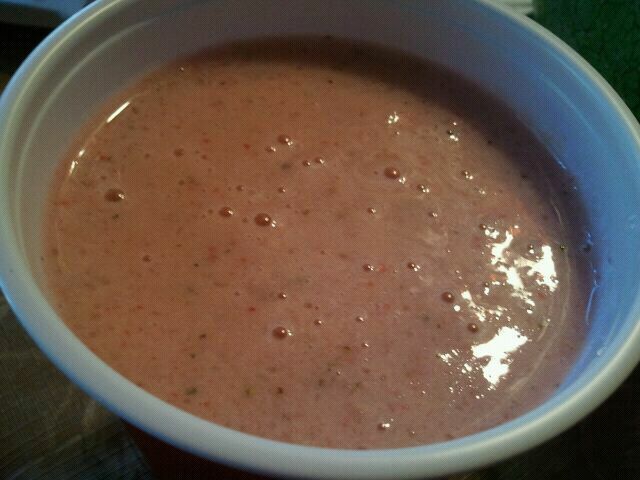 It had a nice blend of flavors that tasted like lime, lemon and granny smith apples all mixed together. This one was my favorite of the three. 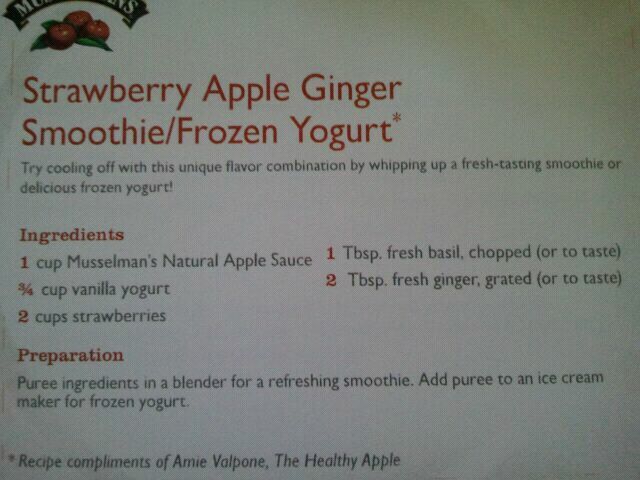 All three of the applesauces had a “heftier” feel and texture than your typical applesauce. Not saying it was a chunky variety per se, but it had a bit more of a bite and wasn’t as smooth as other applesauce I have had before. They were also suprisingly filling (probably due to the 3 grams of fiber per cup). 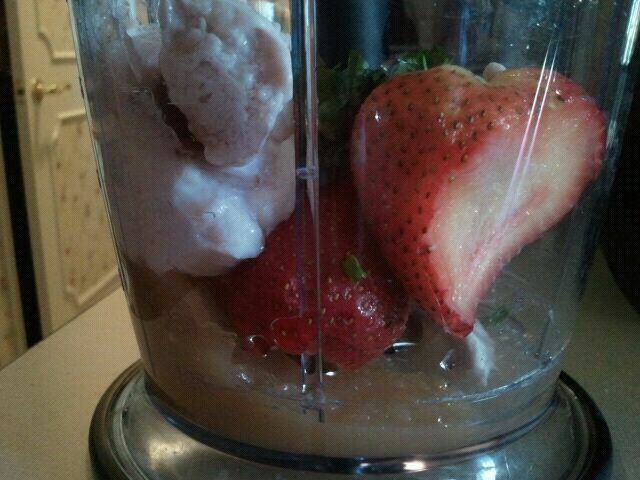 One cup is 70 calories, 0 grams of fat, 17 grams of carbohydrates, 3 grams of fiber, and 0 grams of protein. You also get 25% vitamin C and 10% calcium. Berry Pomegranate-apples, water, dextrin (soluble fiber source), apple concentrate, blueberry concentrate, calcium lactate (u.s.p. grade) and ascorbic acid (vitamin c), natural flavor, pomegranate concentrate. Raspberry Acai-apples, water, dextrin (soluble fiber source), apple concentrate, raspberry puree, tart cherry concentrate, acai puree, calcium lactate (u.s.p. grade) and ascorbic acid (vitamin c). Key Lime Cupuacu- apples, water, dextrin (soluble fiber source), apple concentrate, cupuacu concentrate, key lime concentrate, passionfruit concentrate, calcium lactate (u.s.p. grade) and ascorbic acid (vitamin c).